Home / Summer Collection / Lace Jeans Trousers / Wonderland Jeans-2,Version-2, Limited Product ! Wonderland Jeans-2,Version-2, Limited Product ! Wonderland Jeans, several styles on the same pants, depending on the mood of the day. Being able to work as well, during exhibitions, openings and / or outings with friends! SKU: N/A Categories: Jeans trousers winter collection 2019, Lace Jeans Trousers, Lys Majesty Collection 2019, Multi-fabrics jeans trousers, The must-have, Trousers, Jeans Collection 2019, Winter Collection Tag: limited product ! High-waisted jeans with 3 butterflies in yellow and purple lace, inlaid in and a yellow and purple lace round inlaid between each butterfly. There is a row of 3 yellow lace butterflies and 3 rounds along the top leg on each leg. There is a row of 3 purple lace butterflies and 3 rounds along the bottom leg on each leg as well as 2 transparent snaps on the left and right side of each butterfly. 2 bands at the aisne on both sides of the jeans, lace encrusted in the jeans pants, including a yellow that is a little higher than the purple band. Behind the trousers a row of 2 yellow lace butterflies with between each a round yellow lace, at the knee crease, on each leg and the outer side of the leg. 14 flowers in jeans of 7 different colors (light pink, pastel green, salmon, dark green, turquoise blue, fushia pink and pale yellow), embroidered with yarn of several colors. 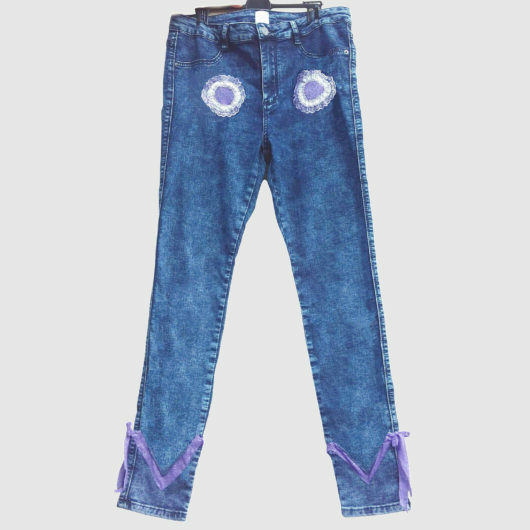 These flowers have snaps sewn on them to tie them all over the jeans, above the butterflies, behind the pants and all along, transparent pressure buttons, barely visible are also behind the pants. One can thus with several styles in on the same trousers. Peace N Love ( Caméléon ) Jeans, Limited Product !